Youth at Devereux Cleo Wallace attend an on-campus school program that is accredited by the Colorado Department of Education and the North Central Association of Colleges and Schools. Students are provided 6 hours of school instruction per day, 12 months a year. High school students can earn .25 credits each quarter per class. There are 8 classes per day = 2.0 credits per quarter. Their progress is documented on report cards and transcripts, which are sent to their home school district and their parents/guardians. Devereux Cleo Wallace employs highly qualified teachers who hold a Special Education license and teachers who are working toward their endorsement in Special Education. We also employ highly qualified paraprofessionals who work closely with teachers and students on a day-to-day basis. The academic curriculum at Devereux Cleo Wallace is developed in alliance with the Colorado state content standards and the local school districts’ grade level benchmarks in reading, writing, and mathematics. Reading, writing, and mathematics are considered the core academic subjects at Devereux Cleo Wallace, and 45 minutes of instructional time, each day is dedicated to each of these core subjects. The remainder of each school day includes instruction in at least three elective subjects such as science, art, social studies, health, affective education, computer literacy, independent living skills, and physical education. Because of the diversity of our student population, academic instruction is individualized much of the time. 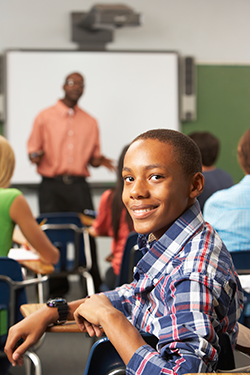 Students with lower intellectual functioning who require instruction with life skills focus are provided with a curriculum that is appropriate to their skill level utilizing functional academic materials. This group of students is also provided with a wide variety of community experiences, the goal of which is to generalize functional lessons learned in the classroom to the real world. An Individualized Educational Plan (IEP) is developed and support related services such as Speech/Language Therapy and Occupational Therapy are provided for students who qualify. In addition to academic instruction, Devereux Cleo Wallace also employs educational diagnosticians and liaisons who administer educational testing assessments, conduct annual, triennial, and review IEP meetings preparation, and works with the rest of the treatment team to facilitate a smooth transition to the youth’s home school district upon discharge.